Mothers who have lost children to violence refuse to lose hope, and dedicate themselves to movement to keep other mothers from feeling their pain. (FinalCall.com) - Mothers whose children have been murdered say to receive that news turns an unimaginable thought into stark reality. Refusing to be overcome by grief, many are turning pain into power so other children might be saved. “My heart goes out to anyone who has lost a loved one. It’s a different type of hurt when you have lost a child. I have lost family members in the past but this is a different level of hurt,” said Sybrina Fulton, one of the latest, unsolicited members of an unenviable sorority of women whose children have been killed. “I would tell mothers to read their Bible. Think about the good times they had with their loved ones, and it’s okay to cry. If they want to cry they should cry but then after they dry their eyes, they should say a little prayer and then keep pressing forward,” Ms. Fulton said. Trayvon’s murder ignited a massive outcry against racial profiling of Black males in America. He was visiting family in Sanford, Fla., on Feb. 26 and had gone to a convenience store for snacks. On his way back, Trayvon was followed and shot by George Zimmerman, who claims the unarmed teen “looked suspicious” and attacked him. Knowing she has another son in need of her love, care and support helps Sybrina Fulton get through each day. “It’s just that missing part. It’s obvious that I’m going to miss him. I don’t know how I’m going to go through this Mothers’ Day ... probably like I do any other day since this tragedy happened, which is just to remain prayerful and keep pressing forward,” Ms. Fulton said. Since his death, she and Tracy Martin, Trayvon’s father, have traveled the country, speaking to supporters and media about the injustice. She gets through by working for the cause and staying focused on justice for Trayvon. “I just really appreciate the support that everybody has given us, and reaching out to us. It’s one thing for us to be going through this, just our family and the attorneys, but it’s another thing for people all across America to support the cause and support this movement,” Ms. Fulton said. There have been national marches and rallies in Sanford, Fla., New York, Washington, D.C., Los Angeles, other cities, small towns, protests on college campuses in several states and the U.S. capitol. Some children’s murders have garnered national and international media attention and other names remain unknown. But the mothers say each life matters, their pain is real, and it usually stirs up when Mothers’ Day approaches or they hear another mother’s child has been killed. “It’s the ultimate of pain. It’s beyond anything that anybody would ever want to experience and I wish it not on anybody,” said Vicky Lindsey, founder of Project Cry No More, a Los Angeles-based support group for murdered victims’ families. The group acts as a sort of first-responder, offering resources like counseling and supplemental burial expenses in communities where children have been killed, whether by police or gang violence. Her son, Lionel, was killed 20 years ago and his case is still unsolved. All she’s been told by authorities is he was shot while riding in the car with friends. But Ms. Lindsey had been working to help victims’ families long before her personal ordeal. She began working in the movement to save lives in March 1988 through M.A.G.I.C. (Mothers Against Gangs in Communities). “When I got that call that Lionel was killed, I was hurt but felt as though I still had my power. I did everything from going to identify his body at the hospital to closing the casket because I could hear Lionel saying, ‘I know dang well you’ve been fighting this long for me, you’re not going to give up now,’ ” Ms. Lindsey said. According to Ms. Lindsey, people don’t realize the pain is real until it knocks on their door. “Then, it’s like discovering America because it happened to you, but all murder and killings, are the same pain, whether it’s Trayvon Martin, whether it’s Frederick Martin, whether it’s Oscar Grant, whether it’s Derek Smith, Phillip, Lionel or Reggie,” the victims’ advocate argued. “People run out to police brutality meetings like it’s the end of the world but it’s the end of the world to a family member when their child is murdered, even when it’s ‘Lil John-John’ on 159th Street,” she said. Ms. Lindsey reflected on a meeting she and other mothers had with the Honorable Minister Louis Farrakhan. The visit and his guidance was a catalyst in her continuing to work to empower victims’ families. Min. Farrakhan delivered a piercing message during a “Stop the Killing” rally in California at the Compton College Auditorium on June 22, 2005. Min. Farrakhan prayed that his message would comfort those who mourned the loss of their loved ones to senseless violence but his focus centered on the pain of mothers. He asked gang members to imagine their own mothers’ pain to bring them into the world, nurture, and then think about the mothers of those who they have killed. “What a terrible thing to rob a mother of her child. ... If you went to a funeral of one of your homies and seeing his mother crying, how could you leave, feeling their pain, and go and kill another mother’s child? We have become so cold,” Min. Farrakhan observed. “That was the most heartwarming, touching event ever, ever, ever. We appreciate and respect Min. Farrakhan doing that, for showing us that he cares, especially when he walked off that stage, walked into the crowd, into the row and embraced us. The Christians, the non-Christians, some of them who don’t even believe in God, they felt that,” she said. Wanda Johnson held on to God when her son, Oscar Grant, was killed by Johannes Mehserle, a former Bay Area Rapid Transit District officer. Cell phone videos of the January 31, 2008 shooting on a station platform went viral and his killing sparked worldwide attention. Mass protests and riots erupted and the incident forced the first jury trial and conviction in California history of a police officer for killing someone in the line of duty. Mr. Mehserle faced 2nd degree murder charges but was found guilty of involuntary manslaughter and received a two-year sentence. “Had I not had a relationship with the lord, I probably would or could have fallen into depression. There were days among days where I just sat and cried,” Ms. Johnson said. She talks often about the time spent with Oscar on her birthday, the day before he was killed. They joked, laughed and enjoyed each other. She also thinks heavily about encouraging him to take BART instead of driving. She thought he’d be safer because it was New Year’s Eve. “But I know God knows all things. Through prayer, God gave me strength to come up from that and the work now is to encourage others because a support system is good. It takes prayers, family around you to love you, to tell you it’s okay, hug you now and then, tell you it wasn’t your fault,” Ms. Johnson said. Her brother, Cephus “Uncle Bobby” Johnson, rushed to her aid, became her mouthpiece and more than a shoulder to cry on. The family launched the Official Oscar Grant Foundation to advocate for other victims of police brutality and senseless street killings. Ms. Johnson has authorized filmmaker/actor Forrest Whitaker to turn her son’s story into a movie. According to Beatrice X, filming is scheduled to begin mid-July 2012, and producers are in talks with Academy Award winner Octavia Spencer to portray Ms. Johnson and actor Michael B. Jordan for the role of Oscar. Ms. Johnson is excited about the movie because like the book written by Student Minister Keith Muhammad of Oakland (“Grant Justice: Lessons Learned”), it can become a teaching tool for people to know racism still exists and that Oscar’s life mattered. For Mothers’ Day each year, she runs to the memory of her son, particularly a card he gave her the year before he died. She keeps it on her dresser as a reminder of his bright smile and how he drove celebrations. “Did you call mom? Are we taking her out,” Oscar would tell her daughter, Ms. Johnson recalled. “We have to get the number one message out that we’re not going to accept (killings). Our African American young men’s lives matter and we have to eliminate the killing going on by officers as well as Black on Black crime,” she added. Beatrice X said it’s important for Blacks to unite. It takes a village and when something happens to a member, you don’t just sit around and let it happen, she said. “We have to get back to that protection of the family,” said the Muslim activist, who is a member of the Nation of Islam. She thought about her own 17-year-old son often during their back and forth trips to trial for Oscar. 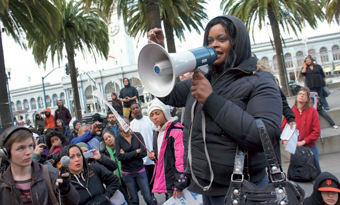 She got involved heavily in the “I Am Oscar Grant” movement when her son was just 14-years-old. She stayed with Ms. Johnson the week of the verdict and watched her endure enormous pain just to get up and walk out of the door to attend court proceedings. “She got out of that room because she called on God with all her heart, mind, soul and every fiber of her being! When mothers call me, as they often do because they’re having a bad day, I tell them to immerse themselves in the word and call on God, because I love the mothers and the sisterhood,” she said. Love compelled Theresa Williamson to carry the picture of a neighborhood youth that had gone missing around in her wallet for two years. Her daughter, Nicole, was murdered in November 2003. While passing out flyers in search of the killer, she met a woman who was also distributing flyers of a nephew who had run away from home. The women exchanged flyers, hugged, prayed, and wished each other well in their searches. “Two years later, that picture that I had carried around in my car of that 13-year-old child that I prayed about and said ‘another lost young man’... why when the wanted posters went up, he was the one who murdered my baby!” she said. She had lamented for him. “All I could see was a 13-year-old child and if it’s something I could say to him to help get him off the streets and back to his family, not knowing that’s the same picture the police got,” Ms. Williamson said. She learned during trial that the killing was part of a gang initiation. The shooter didn’t even know her daughter. The killer received 10 years for the murder and is supposed to be released in 2015. Ms. Williamson feels the juvenile justice system needs an overhaul. “He had carjacked, committed a home invasion and he shouldn’t have been out there to do this. ... He was drug-addicted and couldn’t read at 11-years-old and somebody needs to answer for that,” she said. Since the murder, Ms. Williamson worked as a public safety commissioner in her city for six years, has organized peace rallies in her neighborhood, and advocates for other mothers, like Enola Causey. Ms. Causey struggled through tears when The Final Call simply asked her son’s name. 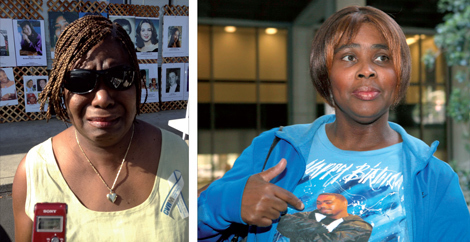 “My son, Donnie Causey, Jr., was murdered December 10, 2002,” she finally whispered. He was at his grandmother’s house on a lunch break when someone walked up and shot him. “He (the shooter) didn’t apologize and said he did that to get to someone else, my brother, who had had a fight with him,” Ms. Causey continued. She tried to share more but was overwhelmed by tears. She and Ms. Williamson say at least three other women in their church are in similar situations. “I just became very active, which, I should have been active before but I became one of those like, ‘Don’t touch me,’ ” said Ms. Williamson, covering her ears, then hands by her eyes and facing backward. No petitions for help could get through because she had her blinders on. “My biggest thing was, ‘Thank you Jesus! Our daughter was in college. We thought, ‘she’s safe.’ Nobody could have told me she would have gotten killed right in front of her own house, but we’re never safe until parents start raising their children,” she said. Valerie Bell, Sean Bell’s mother, said his father always said the son would be famous—they hadn’t imagined how and how painful his “fame” would be. The night before he was to marry the mother of his children, he died in a hail of bullets fired by NYPD officers. The officers were tried and acquitted of murder charges. When the shooting first happened, she recalled the labor pains felt when all three of her children were born. “Why me?” she wondered. Until she said she realized God’s plan included more than just a wedding for Sean. “The tragedy turned into triumph because of what we’re doing in my son’s name. We were able to get a street named after him,” she said, referring to Sean Bell Way and fighting back tears. “And a community center, which gives back to the community because he was a person who gave back wholeheartedly to his friends, his family and people on the streets he didn’t even know,” she continued. His parents established the center through the Sean Elijah Bell Foundation. It provides an after-school program, a GED program, job preparation services, a dance school, and karate classes. “Keep the memory, even though it hurts keep the memory and don’t give up on believing that God will work it out for you no matter what you go through,” she advised families of those who have been murdered. Denika Chatman relocated from Seattle, Wash., to San Francisco after police killed her son Kenneth Harding, Jr. in Bay View Hunters Park. Reports indicate when officers questioned him about paying a fare on the railway system, he ran. Police said he fired a gun at them. They even claimed he shot himself, but witnesses said the only shots fired came from the officers’ direction. Cell phone videos captured him writhing in a pool of blood. May 16 marks 10 months since his death and still, his case is unsettled, according to Ms. Chatman. “I don’t have a mortuary report, a coroner’s report, no death certificate, and I still don’t qualify for victims of violent crime. Even his property and money is still under investigation,” she told The Final Call. She wants to file civil charges but is in limbo pending investigations. Facing the reality of her son’s death is hard sometimes. “I’m waiting for him to walk through that door but at the same time, I know it’s real because I have to live it. Your healing is within your helping,” she said. Through the Kenneth Harding, Jr. Foundation, she spends days serving food to those less fortunate and speaking at schools. “All I want to is to touch kids so no one becomes him,” Ms. Chatman said. LaWanda Hawkins started Justice for Murdered Children on December 6, 1995 when her only child, Reginald, was murdered at 19. 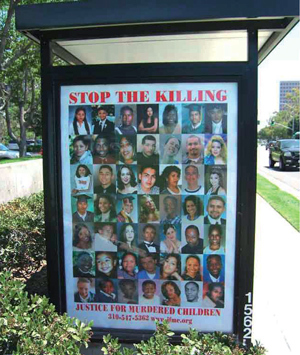 The organization reaches from San Pedro, Calif., to other communities and has amassed numerous portraits and stories of murdered children. During a recent pancake breakfast fundraiser in Carson, Calif., she spoke to The Final Call about the importance of raising awareness about the value of life. “We can’t just ignore that these kids were murdered. There are a lot of things that happen along the way and they might be bad but it’s nothing worse than having your child murdered,” Ms. LaWanda Hawkins said. It’s about all cases, like those that never get written about, she said.